We are absolutely focused on creating the right paints and coatings for your living spaces. Learn about our paints, application tips and more! What are your home coating needs? Select your usage to find the right product. 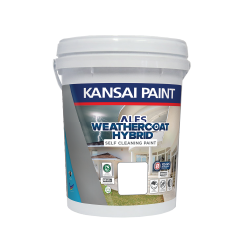 ALES Weathercoat Hybrid by Kansai is an acrylic, high performance, superior quality exterior- grade emulsion; that gives a lively coat that exceeds conventional acrylic emulsion finish. 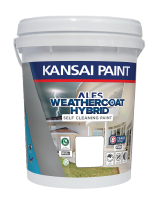 A hybrid of silicone emulsion that is specially formulated to withstand harsh tropical climate, ALES Weathercoat Hybrid is formulated with 8-years protection warranty against flaking, peeling, fungi and algae growth. What’s more, it has the ability to clean off dirt through rain water. For use on new or previously painted exterior masonry surfaces such as brickwork, plaster, cement rendering and asbestos where performance of up to 8 years protection is required. Recoat : 1 - 2 hours. Dilution - Clean household water. Cleaning Up - Immediately with clean water. Brush or Roller	 - Ready for use. If dilution is required, add up to 5% clean water. Conventional Spray - Dilution of up to 10% water. Airless Spray - Ready for use. NB : PAR Primer Sealer and PAR DC Primer work best on surfaces with a moisture content of below 15% and alkalinity below pH-9, otherwise premature paint failure may occur. Not suitable for use in areas subject to frequent or heavy condensation, e.g : in some kitchens and bathrooms. Testing for use on new or previously painted interior masonry surfaces such as brickwork, plaster and cement rendering where regular cleaning is a pre-requisite.